Primary school-aged children could develop better maths skills in just three weeks if technology-enabled teaching methods were employed more in classrooms, according to research conducted by the University of Canberra and Samsung. A study involving researchers from the University’s STEM Education Research Centre found that using digital apps over a three-week period produced the same results as a year of using traditional methods. STEM Education Research Centre Director and Centenary Research Professor Tom Lowrie recently spoke about the university’s collaboration with Samsung at the Future Proofing Stem Industries Summit in Sydney where he argued that mathematic performance at school is the best indicator of success in later life. The research, conducted in partnership with Samsung Electronics Australia, is based on two separate projects – one aimed at primary school children and the other at high schoolers. The primary school project incorporated digital apps into the teaching and learning program. Professor Lowrie said after three weeks the results pointed to an effect size of 0.5 which is an equivalent improvement normally achieved over a year. “The group of students we worked with increased their spatial reasoning score by 12 per cent while also recording a 20 per cent improvement in the mathematics test,” he said. “Spatial reasoning is our ability to locate, orientate, and visualise objects, decode information graphics, and use and draw diagrams. “The secondary school component focused on student-led STEM enquiry projects using Samsung technology for data logging, analysis and as a storytelling/reporting tool. Samsung Electronics Australia’s Head of Corporate Social Responsibility, Tess Ariotti, said concern for Australia’s education standards continues to evolve. “We’ve joined forces with the University of Canberra to start a conversation with the government and community around implementing tangible change across the national curriculum,” Ms Ariotti said. The full research findings and analysis will be released in an academic report in 2018. 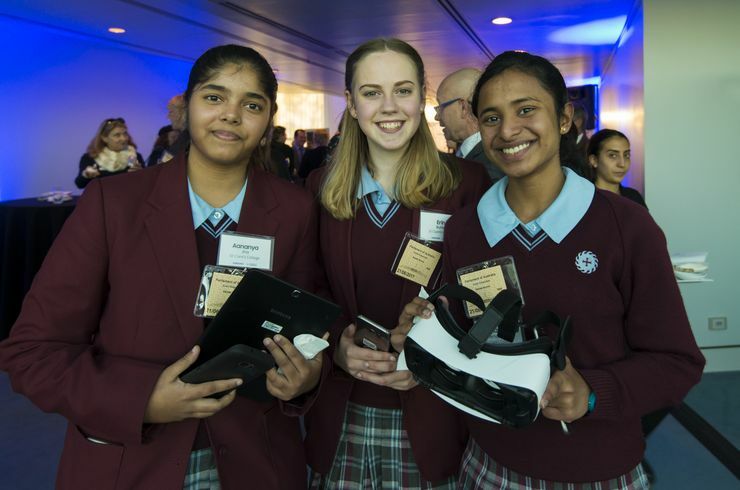 The Samsung-SERC Spatial Reasoning Research Program aims to increase the STEM literacy of young Australians, in particular of those from low SES backgrounds, by using technology and innovative practices.